Please contact our Re-homing & Rescue Coordinator Bev Davey for help and/or further information. Sometimes circumstances dictate that we are put in a position where we feel we have no choice but to re-home our beloved pet. You may be experiencing some behavioural problems with your Eurasier and feel you cannot go on. In this case we could be the lifeline you are looking for! It could be you are in need of some advice on how to better communicate with her/him so that you can both get back on track to living a happy fulfilling life together. We can give you this advice that can help you resolve the issues without you having to part with her/him. If there is another reason that you need to re-home your Eurasier and it really is not possible for her/him to stay with you any longer, you firstly need to approach the breeder of your Eurasier, as you may have an agreement with them to take her/him back if the need arises. Or, they may be willing to take her/him back even if there is no agreement. We can also help you to make contact with the breeder if needed. If the breeder is unwilling or unable to help, then you can contact us to help re-home your Eurasier to a suitable family. We are not here to judge, we are here to help! Please don’t feel you have to take your Eurasier to a shelter. If you are someone or a family that feels you have the time, love and patience to give to a rescued Eurasier we would love to hear from you! 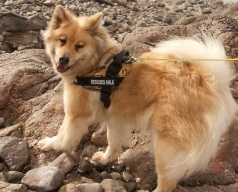 Although thankfully it is not very often we have a Eurasier needing a new home, it is not unheard of! If you are lucky enough to be able to adopt a Eurasier we will give you all the support you both need. All funds donated to ESUK Rescue are used solely for that purpose e.g. collection expenses, upkeep and foster care, behavioural assessment, veterinary care. These funds are not used for any other purpose.